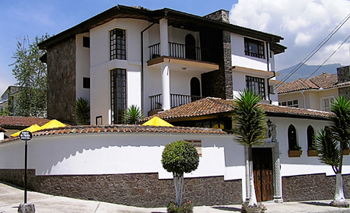 There are many hotels in Quito, most of which are situated in the Mariscal district. 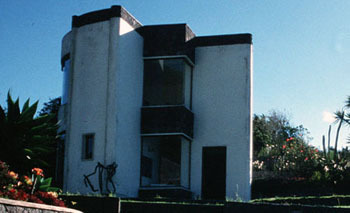 The Mariscal is located between the modern, northern part of Quito and Old Town in the south of Quito. The narrow streets of the Old Town are lined with beautiful colonial buildings. Quito is the second highest capital in Latin America and is situated 20 minutes south of the Equator. Quito was the first city designated a World Cultural Heritage Site by UNESCO. Quito has a lovely climate with warm days and cool nights. It is the city of perpetual spring! 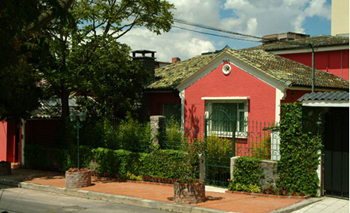 Anahi Boutique Hotel is located in the most traditional, commercial and touristic area of the city. You can get to all the major areas on foot, by taxi or public transport. The hotel is charming and stylish, guided by the prestige value of traditional hospitality service. Every suite in Anahi Boutique Hotel has been uniquely decorated to emphasize the history, different regions and culture of beautiful Ecuador. The Anahi Hotel offers its wellness zone to create inner peace and physical well-being. The guests can enjoy our Jacuzzi, hamman and our aromatherapy as well as relaxing massages. In the "hidden" Cava-bar guests can enjoy their favorite drink, ranging from cocktails and brandies to a wide selection of wines accompanied by a variety of small appetizers. 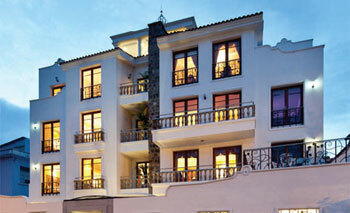 Casa Aliso Hotel offers all the style and comfort of a small luxurious home with an especially inviting interior. It is located in the fashionable residential neighborhood of “La Floresta”, a stone’s throw away from the city, yet just a short taxi ride away from some of Quito's most popular tourist attractions. In keeping with its former status as a private residence, Casa Aliso offers a warm welcome to weary travelers. Situated in a newly-restored historic mansion overlooking Plaza San Francisco, the three-story Casa Gangotena harbours 31 rooms, a showcase of eye-catching style, contemporary design, antiques, fine furnishings, modern technologies and quintessential comforts. Beautifully- and eclectically -appointed, the hotel invites its guests to explore and to relax, whether in the dining room, glassed-in patio, garden redolent with the perfume of native flowers, wood-panelled library, or else atop its panoramic third-floor terrace. Dining at Casa Gangotena is an experience for all the senses, crowned by the impeccable ‘old school’ service of its wait staff. The menu celebrates Ecuadorian cooking from the Andes and the Coast, whether meat, fish, poultry or vegetarian, reflecting the country's amazingly rich and diverse ingredients. Located in the new center of Quito in a safe and peaceful neighborhood, a few blocks from the main touristic area, Fuente de Piedra I offers comfortable accommodation in single and double rooms furnished in a colonial style. In typical Spanish style, this city inn has charming patios where you can simply relax or enjoy reading your favorite book. Its bar-restaurant "La Piedra" is a great place to meet, make friends and enjoy delicious national and international food as well as your favorite drinks. The JW Marriott Hotel is located along the famous Amazonas Avenue within walking distance of the new and exclusive financial district and shopping malls. The renowned Historical Center is only 10 minutes from the hotel, where you can find many museums as well as preserved monasteries and churches. 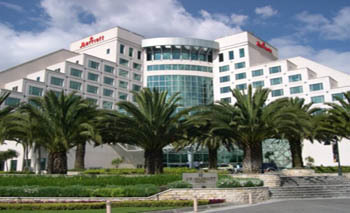 The excellent service offered by the Hotel JW Marriott is complemented by unique and spectacular landscapes with breathtaking views of the Andean Mountain range and topped off by snowcapped volcanoes. 241 deluxe guest rooms including 16 suites are available. All guest rooms and suites offer breathtaking views of either Pichincha Mountain or the city of Quito. Upon completion of a very complex process of remodeling according to strict municipal regulations for historic buildings, this old mansion has become a spectacular La Casona de la Ronda Hotel with 22 rooms arranged around a beautiful central patio, mixing cultural, traditional and contemporary elements. Enjoy all the modern conveniences built into the original facilities; colors and stone walls that reflect the passing of time. The rooms have been designed to provide an authentic experience that reflects the true atmosphere of the unique colonial center of Quito-Ecuador. 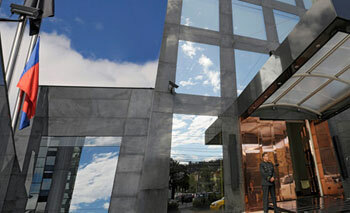 Hotel Le Parc opened in Quito in mid-2007 and brought a fresh architectural style to the city. The hotel incorporates large, floor-to-ceiling windows to let in natural light and provide the suites with a spectacular view of Quito’s impressive hills and volcanoes. Le Parc provides a warm and luxurious setting that offers exceptional service and a meticulous eye for detail, making a stay in Quito stress-free. The four star Hotel Patio Andaluz is a national treasure that holds history within its walls. Situated in the heart of the historic Old City of Quito, which was declared the first cultural heritage of the world by UNESCO in 1978, the hotel is surrounded by churches, museums, and national monuments. It is a marvelous colonial building dating back to the foundation of Quito, and has been beautifully and meticulously restored. Enjoy the enchantment of this elegant, 31-room boutique hotel, with wide corridors, expansive stairways, large arches, balconies, and towering atrium-style patios, which lend themselves to the feeling of a Quito long-ago. One of the first things you will notice when you enter is the sense of tranquility and calm after the bustle of the city outside. 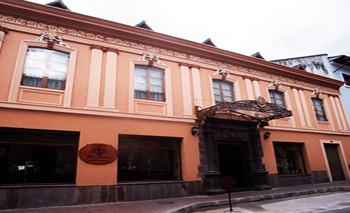 The Plaza Grande Hotel is located in the heart of colonial Quito on the Plaza de la Independencia, across from the Cathedral and near the Presidential Palace. The Plaza Grande Hotel was one of the first hotels ever constructed in the capital, and has been extensively renovated and remodeled to become the finest boutique hotel in the city. On Plaza Grande Hotel you can enjoy national and international specialties in each of our three restaurants, which offer an exquisite gastronomic experience and choose between your favorite cocktail and local specialties, or delight your palate with a wine selected specifically for you by the sommelier in the wine cellar or in one of the two other bars. The Plaza Grande Hotel's Spa offers also a variety of services, including facials and therapies, where you can enjoy the complete care of your body in the absolute privacy of its treatment room. 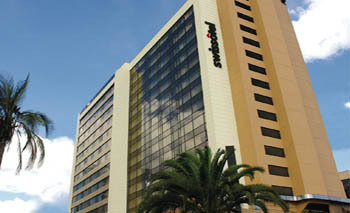 Swissôtel Quito offers 250 tastefully decorated and generously sized rooms and suites. Five excellent restaurants offer a wide range of international cuisine. For your next special event, they offer elegant surroundings, state of the art technology and an outstanding catering service in the most modern and biggest convention center in the city. Known as "The Kindest Hotel of Latin America", it is located in a beautiful residential and commercial area right in the centre of the city. 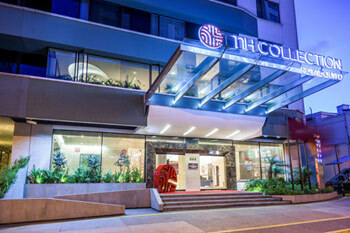 Nestled in the heart of Quito, just steps away from Ecuador’s World Trade Center, NH Collection Quito Royal offers exquisite comfort and style in the hub of the business district. 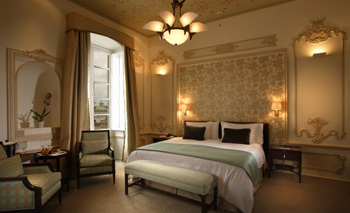 Each of the rooms offers a spacious and bright retreat from the bustling city. Many have views over the mountains. Families and business travelers alike can feel instantly at home in these harmonious spaces. El Relicario del Carmen is a historical, beautifully renovated house with great emphasis on the original detail but with all the modern comforts of today. All the furniture is handmade by well-known Ecuadorian artisans and many original paintings decorate public and private areas. It is located a block away from the main "Plaza de la Independencia” square and the Government Palace as well as being very close to many historic monuments of Quito. The hotel is declared non-smoking. The cozy Vieja Cuba Hotel is placed in the commercial area of the new town. 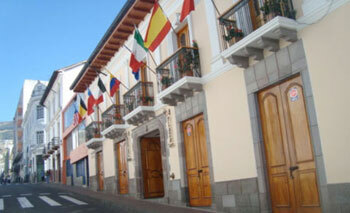 The hotel is an old colonial house fully restored. Its rooms full of light and colour will make the guests feel at home. Guests will be able from each room to communicate worldwide through DDI. At the homely FRUTA-FRESCA café-restaurant you can try delightful breakfasts and lovely cocktails. In its exotic ORISHAS restaurant you can enjoy unimaginable dishes from the AfroCuban cuisine. 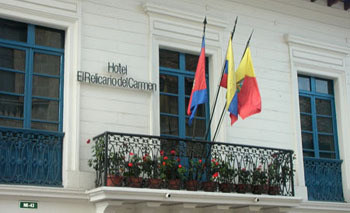 The Plaza Sucre Boutique Hotel is located in the very heart of Ecuador's capital. It is just 20 minutes away from the financial and business area. The rooms in Plaza Sucre Hotel provide a welcoming, comfortable, elegant and relaxed atmosphere that makes guests feel at home. The hotel is also environmentally friendly as solar panels are used to generate all of its hot water. In the Bar Restaurant "The Biscuit” you can enjoy delicious food and wonderful national and international cocktails. 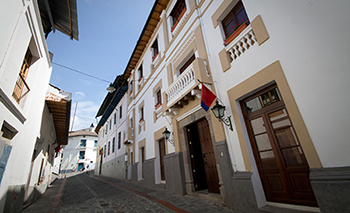 Surrounded by a wealth of culture, history and tradition, the Hotel San Francisco de Quito is located in a XVII century colonial house, which was carefully restored to preserve all its original detail. It also boasts the 25m high "Balcón Quiteño" viewpoint from which you can appreciate the beauty of the old and charming city, taking you on a journey through the colonial period.